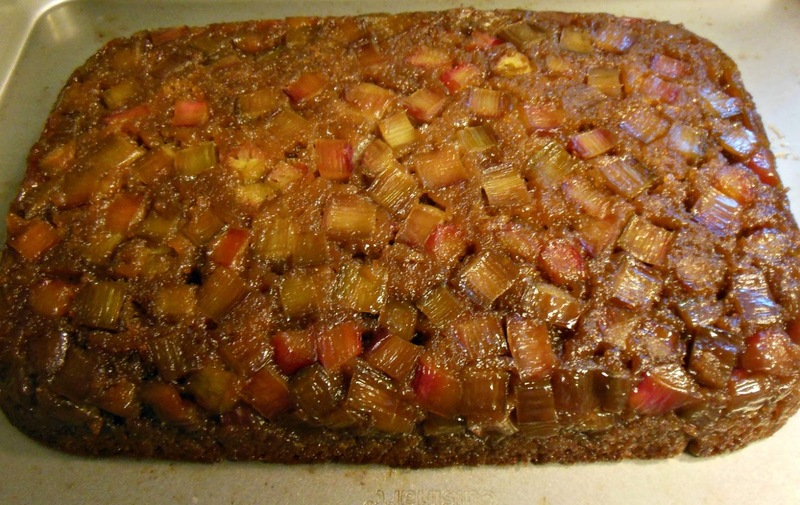 Strawberry Rhubarb Upside Down Cake, from my daughter's kitchen! Who does not like cake I ask you? 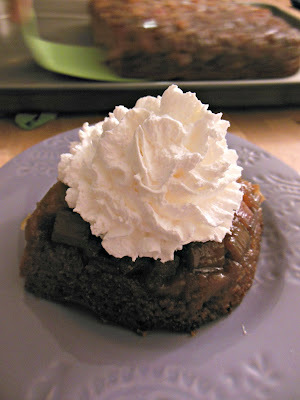 This cake I did not make, but I did get to enjoy for dessert and the rhubarb comes from the garden.....my daughter has a good eye for a delicious cake recipe! Now that I am sharing my daughter's kitchen, and we share in the cooking, grand creations like this one, will be hers, as I am focusing on small batch baking for my days on the peninsula. And I am proud to share them here like I said, this is one delicious cake. While we are much more creative using what we have for our dinners and side dishes, a cake demands more precision and a recipe will usually be followed. When it is as delicious as this cake, expect to see it here. In medium size sauce pan, combine butter and brown sugar over medium heat until butter is melted and sugar has dissolved. Pour into a 9X13 baking pan. Scatter the rhubarb over the butter mixture. Set aside while you make the cake batter. Wash and hull berries, quarter and puree. Measure out 1 1/2 c puree, set aside. In a mixing bowl, combine flour, sugar, salt, and baking soda. Add butter, milk and the strawberry puree, beat for one minute at medium speed scraping bowl as needed. Add eggs, beat on high speed for two minutes, scraping bowl as needed. Gently pour batter over the rhubarb mixture, bake in a pre-heated oven 45-50 minutes or until cake tests done in your oven. Remove from oven and cool for five minutes. Loosen cake from edges of the pan using a spatula and invert onto a serving tray or platter. 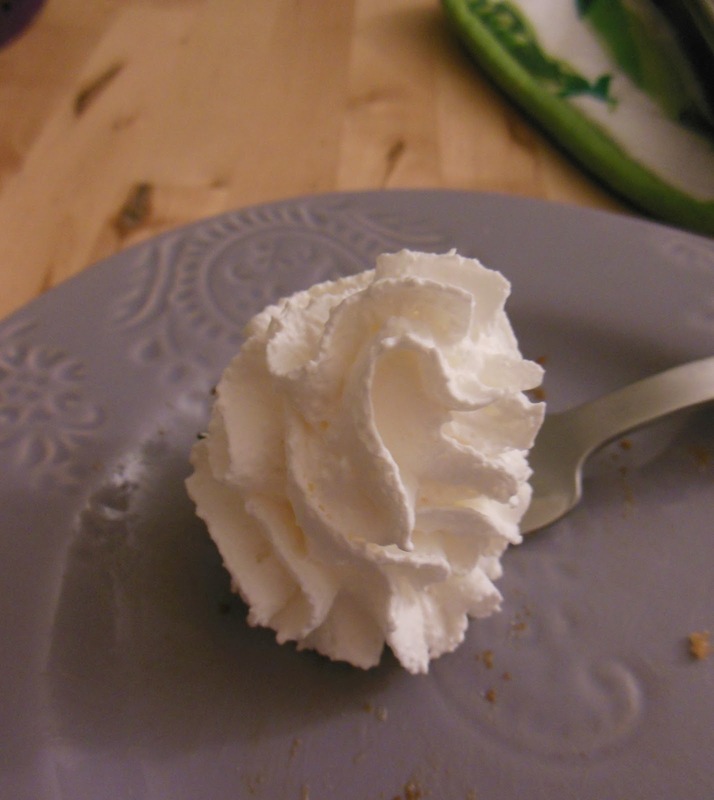 Who else is guilty of wanting another bite of whipped cream, after their dessert is gone? Another delicious recipe, from my daughter's kitchen.